Black and White Blog Hop - My Day! 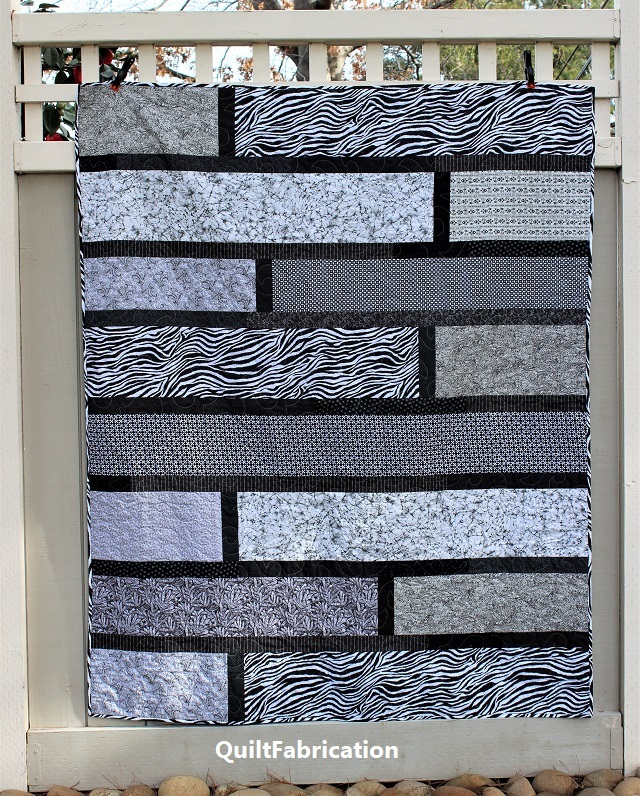 Today it's all about black and white quilts for another fun blog hop hosted by Carla at Creatin' in the Sticks! If you've been paying attention to some of my previous posts, you'll know I've been working on a couple more quilts for Paradise, CA. And funny, they just happen to be black and white - yes, I planned it that way! 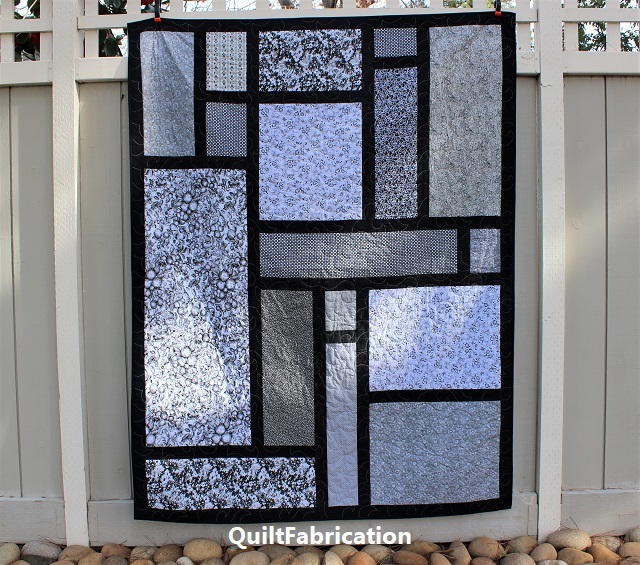 another from my Quarter Cut quilt tutorial, made with a black and white theme this time. made from blacks and whites pulled for Paradise 8, but didn't make it into that quilt. 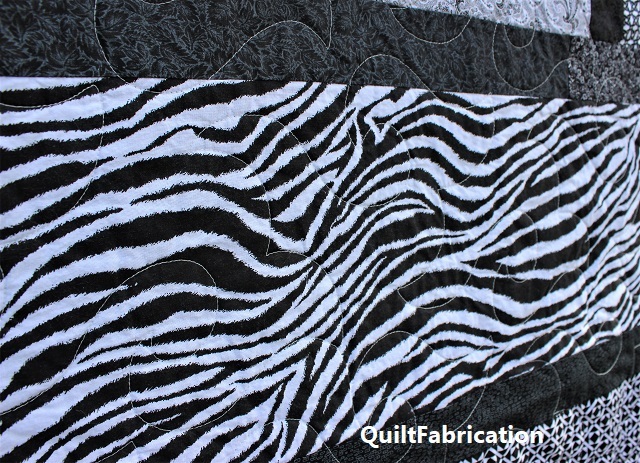 This one is totally free form piecing, using the given widths and lengths of the fabrics pulled. There was very little cutting to make the pieces fit - lucky me! I really like this one too, as it reminds me of an interesting tile setting, with the variety of big and little pieces. Both large lap quilts use the Happy Times pantograph, as it's such a nice open, pleasant design. Don't you just love that zebra print? Tried to use all of it, even with the binding, but still have about 1/2 yard left. And the best of all? Both quilts have the same backing fabric, with a horizontal strip to add a bit of length. Though both backings have vertical seams (dreaded by longarmers! ), I dealt with it just so I could use up that fabric. That's right - 6.5 yards of a sheet music print is no longer taking up valuable real estate in the stash - woohoo!!! I really need to start making one of those fabric in/fabric out tally sheets for the year, as I'm off to a great start on using up the stash. Also notice the numbers behind the quilt names, 8 and 9. It means this is the eighth and ninth quilt I'm sending to Paradise, CA, and probably the last. Nine large lap sized quilts in two months is a pretty good donation number - I hope they provide some comfort. Great looking quilt, and for a wonderful cause! I love that simple design and the fabrics you've used. Congratulation on your finish. I love these and using up stash is awesome! I'm sure they will be such a comfort to those in Paradise. One of my favorite quilts has bright animal prints by Laurel Burch on the front and zebra print on the back. In fact, I'm snuggled under it right now. Yay for zebra prints! They look so good. Thank you for giving to Paradise. Beautiful quilts for a great cause! I'm sure the recipients of these beautiful quilts will be feeling the love behind them. The patterns may be simple but they make for stunning quilts. Both of these quilts are sure to be treasured! Love the panto you used. Nice work! WHAT A GREAT DONATION,THEY WILL BE CHERISHED BY WHOM EVER RECEIVES THEM. Great job, Susan. I have enjoyed seeing all of the different versions you have made and the black and white one is just as lovely as the rest. Beautiful! Thank you for sharing, and I'm sure that the recipients will love their quilts. great quilts! are these for the fire victims? How kind and generous of you. What nice patterned quilts for a quick charity project (weel, atleast there wasn't a lot of tiny piecing). The zebra binding caught my eye right away. wonderful quilts for donating. they are lovely and will surly be loved in return. thanks for sharing. all the fabrics are great. How generous of you to donate these fabulous quilts. What better way to use up the stash...and donating it is an added bonus. You rock! Nicely done! I'm really liking Paradise 9. Large brick settings are fantastic ways to use up stash. They look fabulous in the B&W. Congratulations on your very generous donation. The Paradise fire affected so many of our friends and oved ones. Quilts are truly gifts of comfort. I was just talking to someone about the type of design in Paradise 9, sweet and easy. Classic and modern. I like the sashing frames. 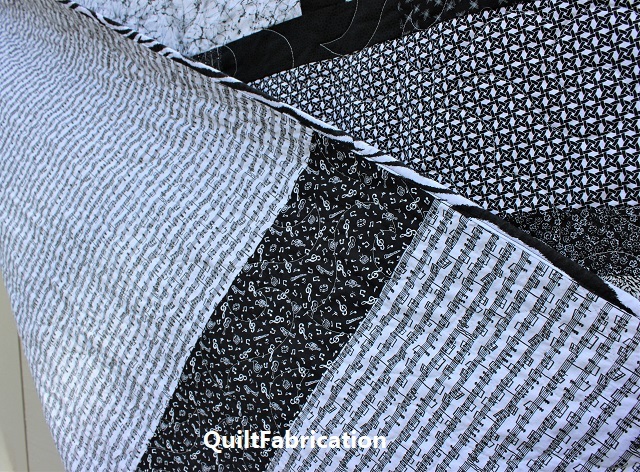 The more Black and White quilts I see the more I love them and need to make some! I have attempted fabric inventories in various ways, but no matter how much I use, it keeps growing! I love your giving heart. Thanks for the tutorial to make the first one. It's always nice to have a fast pattern for donation quilts. A huge thank you for joining the B&W Hop. We really got 2 posts in one! You are such a giving person, Susan! Love the quilts and especially the sheet music backing!! Awesome! How great that you've made nine quilts for Paradise, Susan! What a thoughtful thing to do! I'm sure the families who receive them will be grateful. Gorgeous quilts to donate. Awesome job getting that many completed. I am sure they will be appreciated. Those are fabulous! That is so neat to make them for Paradise families. And bonus, use up your stash so you can make room for more fabric! I like them both and the colors are perfect for anyone. Very kind of you to be donating them. Thanks for sharing...and inspiring us. Great results! My Sister In Law would really like this Black and White theme going on here. Paradise for Paradise! Hmmmm I have Been saving my black and white scraps this looks like a great idea....tytyty for sharing. ..
Good for you using up your stash! 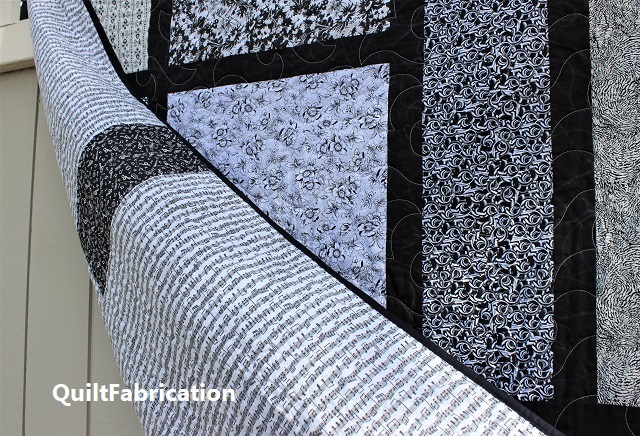 Your black and white quilts are gorgeous and I'm sure the recipients in Paradise will greatly appreciate them! Both quilts have some great stash fabrics. Thanks for sharing your tutorial. Both pretty quilts. Wow, nine for Paradise. That is amazing. What a perfect way to incorporate two missions into one... er... two quilts!! I love these quilts - and what a nice way to use up fabric, especially that huge stash of 6.5 yards. They will be much appreciated by those who receive them.